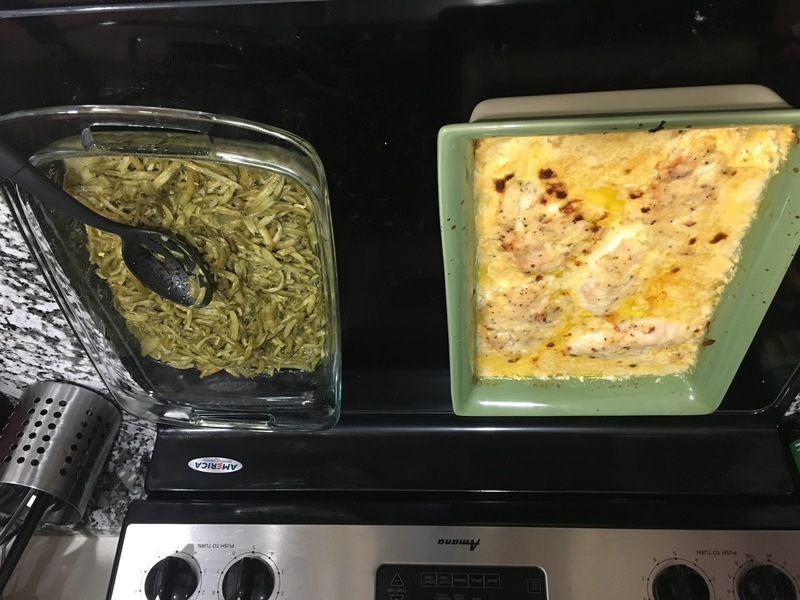 Average Guy Tries – An average guy tries stuff. Everything she mentioned here is legit. And also, did you know that a lot of front loading washers actually have another filter you have to get to and clean? Yeahhh……. i didn’t know that either. Cleaned mine out and found a handful of change. I love ham, and it was around easter. 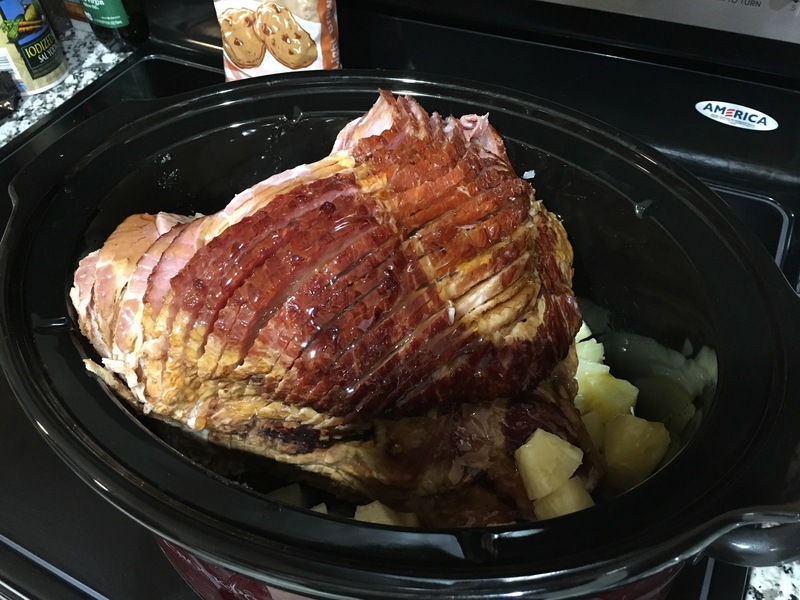 I saw a recipe for Crock Pot Brown Sugar Pineapple Ham and wanted to give it a try. Seems simple enough. 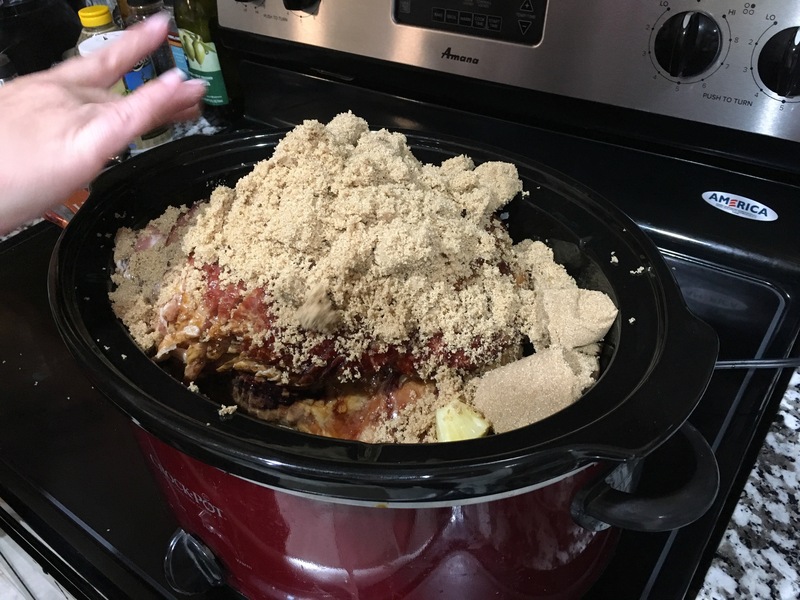 Layer of brown sugar on the bottom of the crock pot. Add sliced ham, open up a bit with your fingers. Dump honey all over it, and a can or two of chunk pineapple. Then add more brown sugar. A bunch more. Turn on Low and…..
…… don’t do what I did, which was fall asleep on the couch. 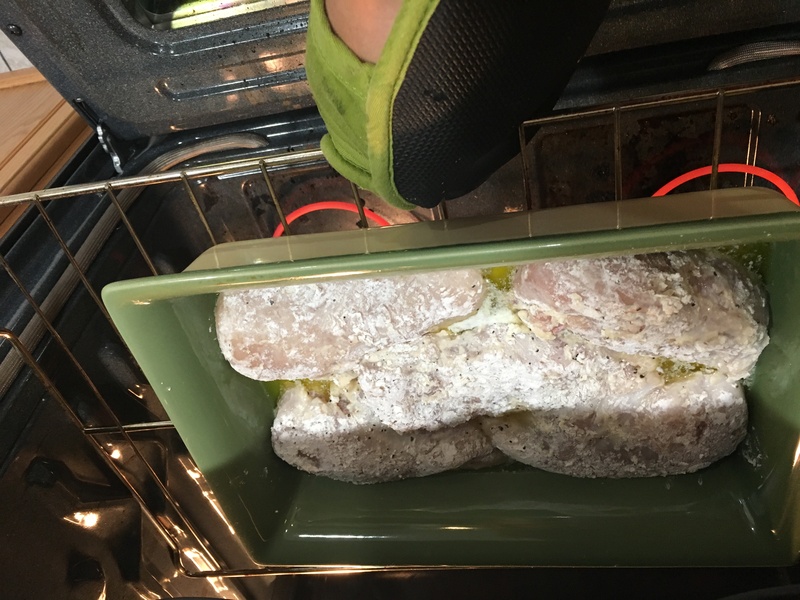 It says to cook on Low for 3.5-4.0 hours. I fell asleep for about 8-9 hours. Oops. Verdict: Actually, it was still delicious. Definitely overcooked but it wasn’t dry at all. I ended up chopping it up into small pieces and adding some barbecue sauce and having sandwiches with it. Lesson learned: Carefully read the recipe. And don’t fall asleep. Or, set an alarm. 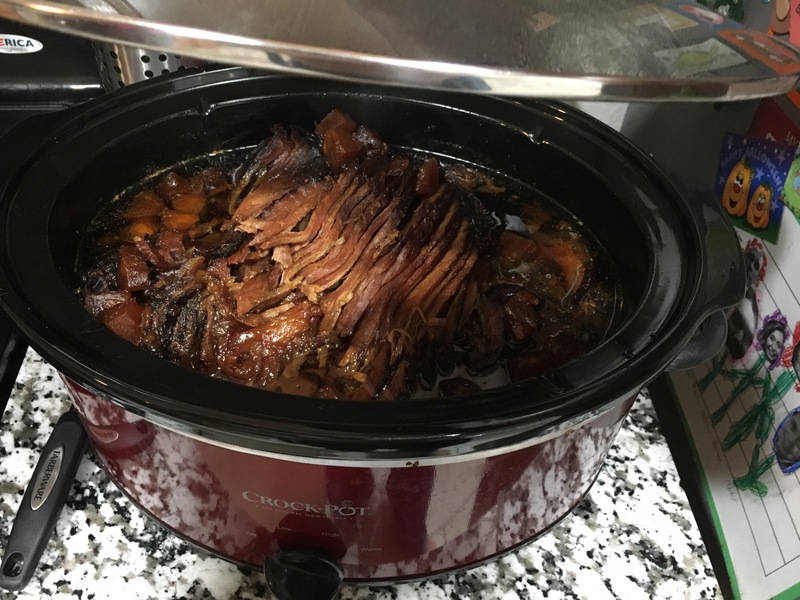 Edit: This crock pot ham idea sounds really good too. I might have to try that one in a couple weeks. 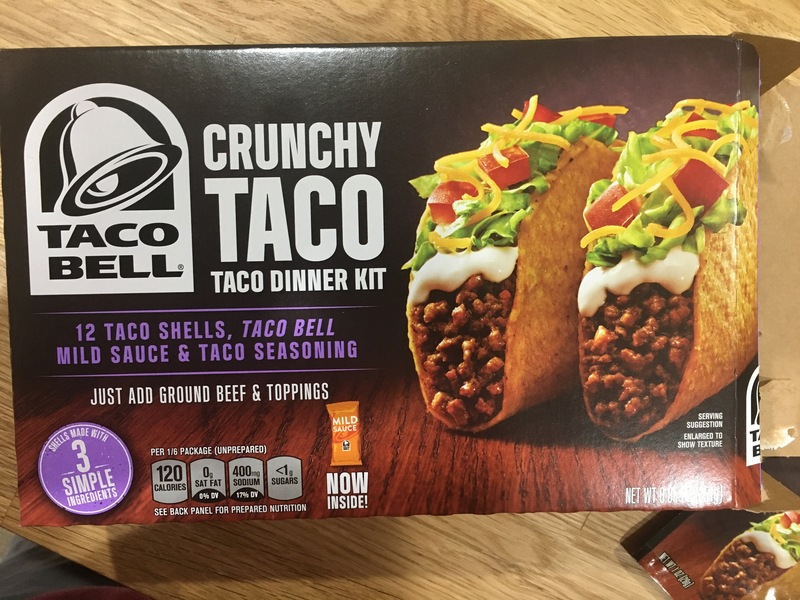 Ever try that “Taco Bell dinner kit?” Just in case you were curious how it was but too afraid to try it, don’t worry. I tried it for you. It was on sale for $2 and I wanted some tacos. 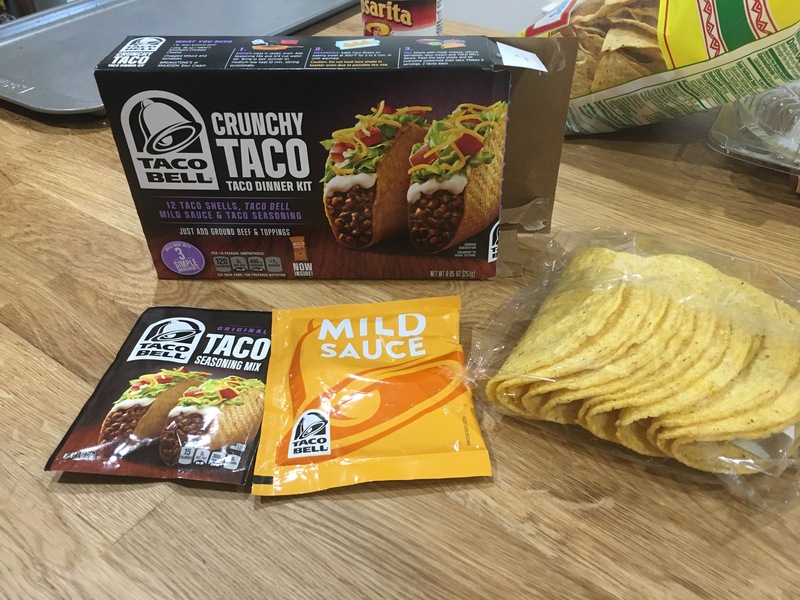 The photos on the box sure look delicious, don’t they? Opening the box reveals the truth: You have to add more stuff. It was supposed to have 12 shells, but I only got 11.5 shells. 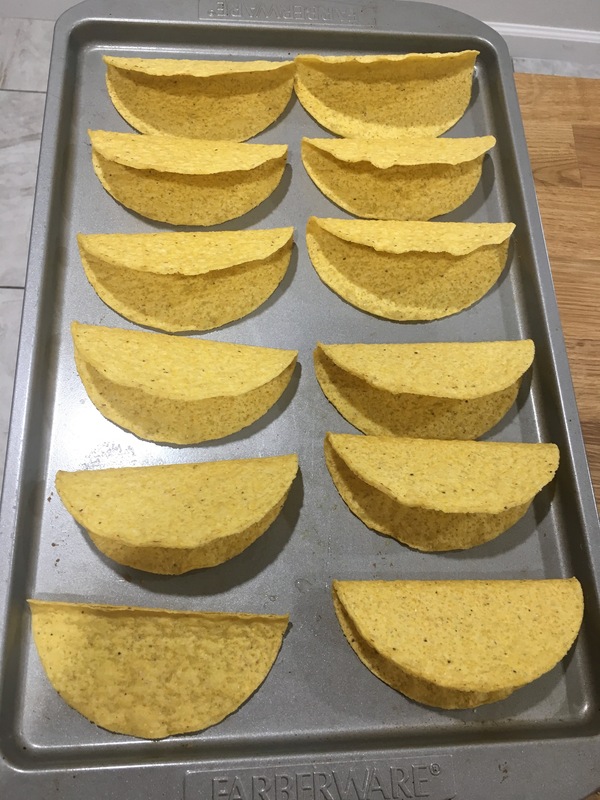 The 1/2 shell made a great tortilla chip, which I covered in salsa. Anyway, you toss them all on a pan and heat them up at 300F for about 5 minutes. 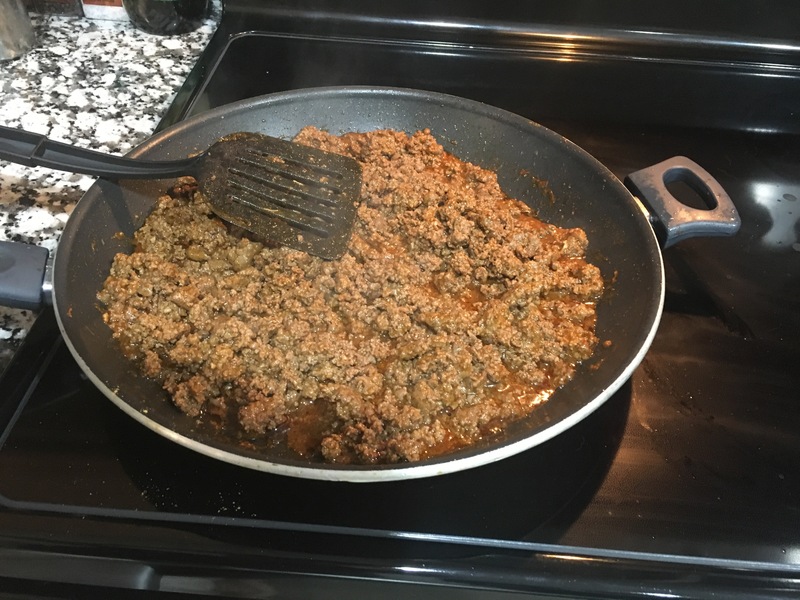 Brown some ground beef. This isn’t too hard. 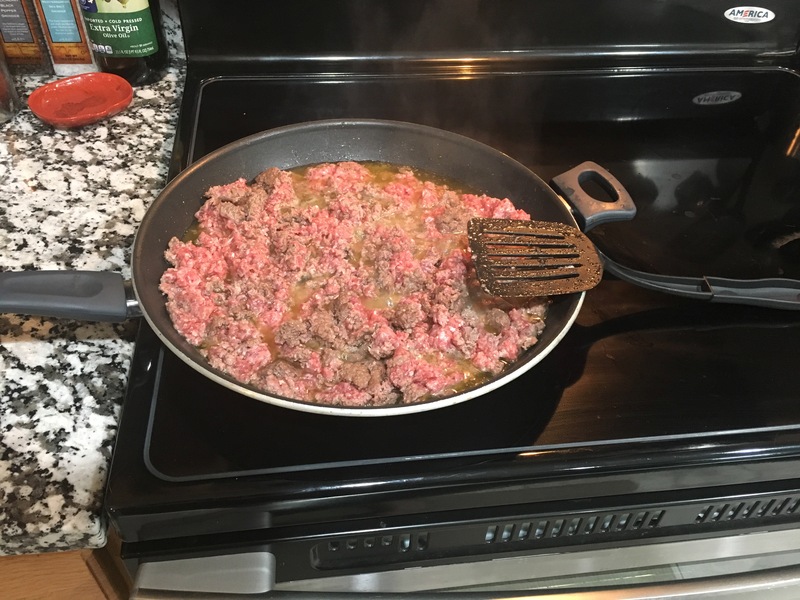 I should have picked more lean ground beef, though. 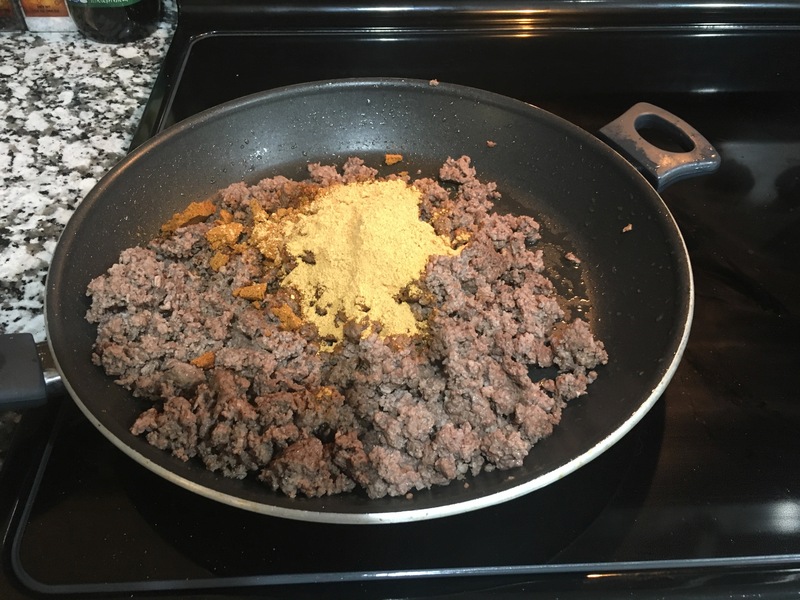 Pour the packet of taco seasoning onto the browned & drained ground beef, and add 2/3 cup water. Mix everything up. Simmer for about 15 minutes on low, stirring occasionally. This is where you start adding stuff. For some reason, a bag of already shredded lettuce was cheaper than a fresh head of lettuce, and laziness prevailed. 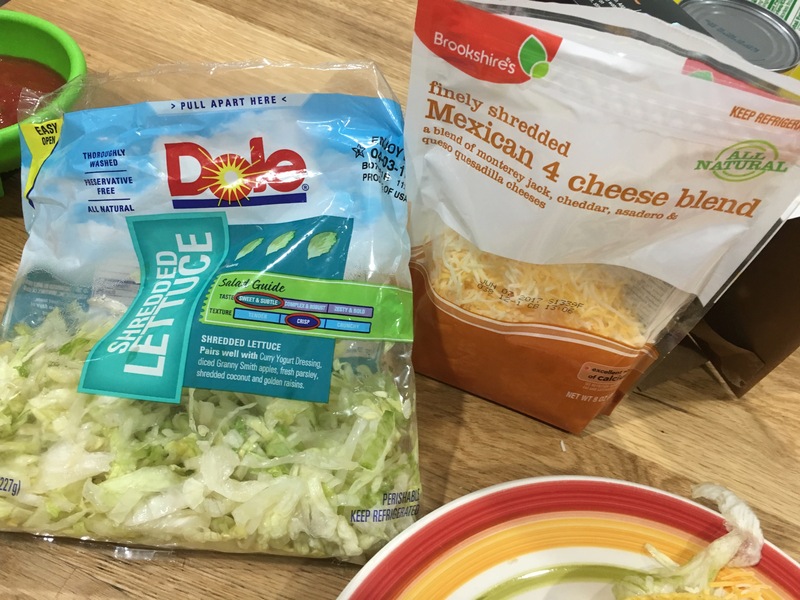 Toss some shredded lettuce and cheese on, and pour on some taco sauce. The taco sauce just comes in a big packet. Tastes just like what you’d get at a retail location. The 4 cheese blend was on sale as well. Verdict: It turned out quite well. 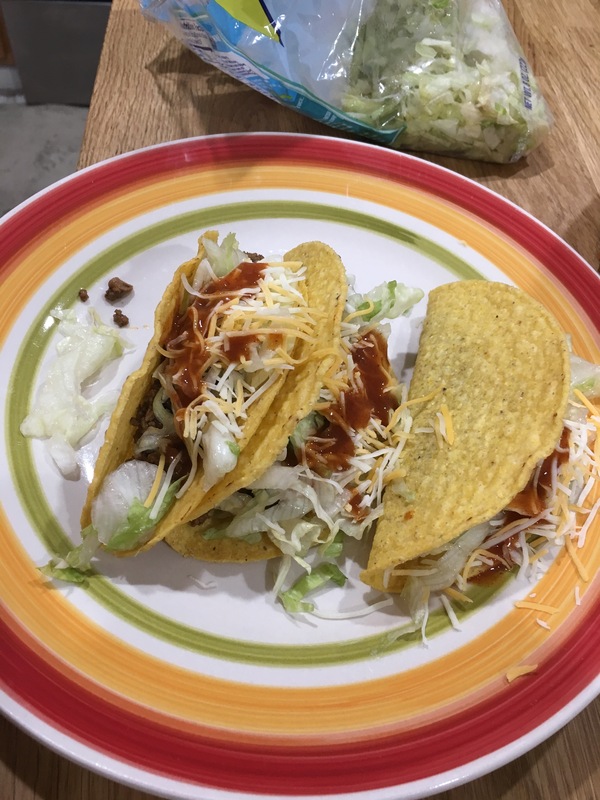 Easy to make, tasted like what you’d get at a regular Taco Bell, and I didn’t even have to put on shoes or leave the house. Total cost for 12 tacos, which fed the 3 of us and one other random kid that came over was less than $10. The ground beef was the most expensive part of the meal.